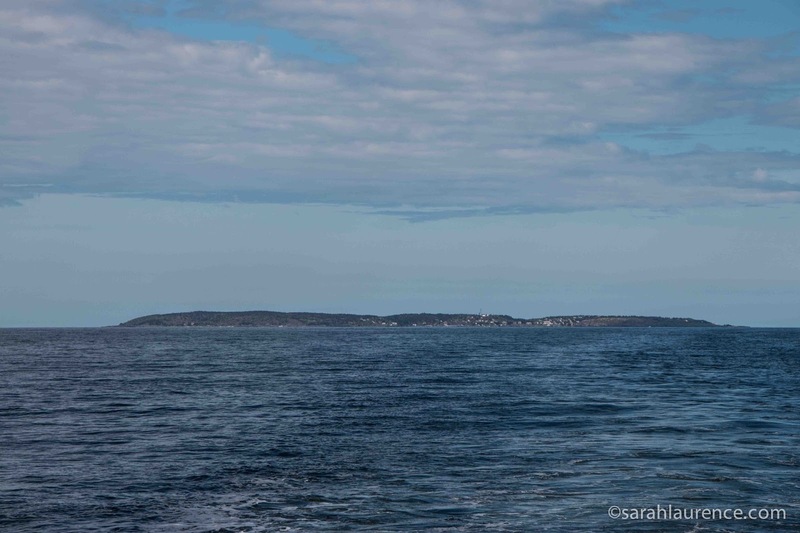 Last week my daughter and I visited Monhegan Island, twelve nautical miles off the Maine coast. I was gathering more material for my young adult novel, and my daughter was gathering botanical samples for her senior project. 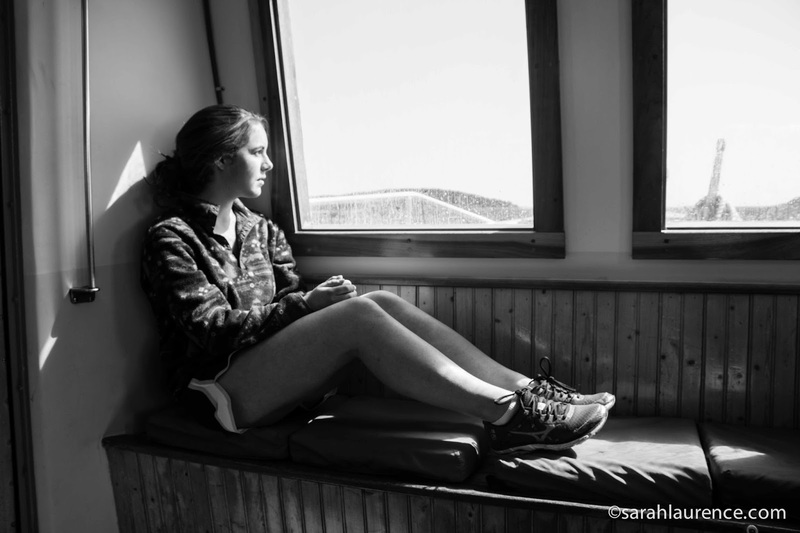 As we waited for the ferry in Port Clyde, she read a draft of my manuscript. My work in progress is set in a harbor town similar to Port Clyde, and one of the characters is an island lobsterman. 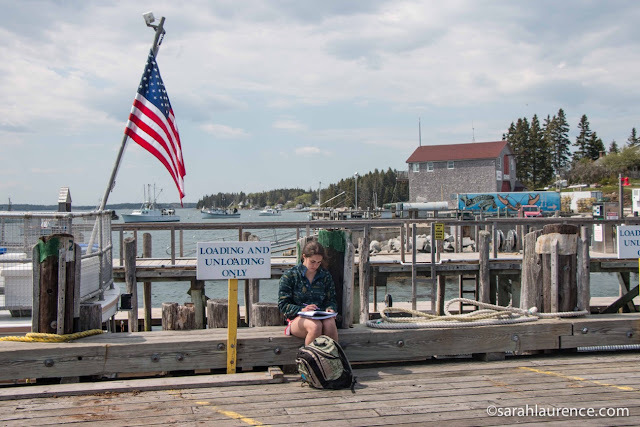 Riding the small mailboat ferry out to sea feels like traveling back in time. 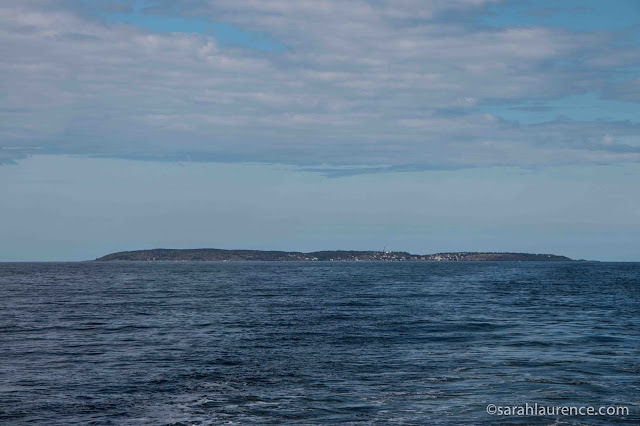 Out the bow windows, Monhegan slowly appears on the horizon, rising out of the sea. The island community just celebrated 400 years of settlement, although Native Americans inhabited it seasonally before the white settlers. Monchiggon was the Algonquin word for out-to-sea island. There are around 40 year round residents currently, depending on how you measure residency. The only access is by ferry, with infrequent service off season. Summer people and birders start arriving Memorial Day weekend. The largest building is The Island Inn, where we stayed since the beachside apartment I rented last spring was unavailable. The Island Inn offered a good deal on a two room suite in their meadowside cottage (the bi-colored house with the dormer windows) with an excellent breakfast buffet. More rustic options are the Monhegan House and the Trailing Yew, which I've enjoyed other visits. All serve breakfast and dinner since there are no restaurants on island. On season there are two coffee shops, a pizza parlor and an excellent brewery (open until 6pm), where visitors and islanders congregate. There is no nightlife after dinner. 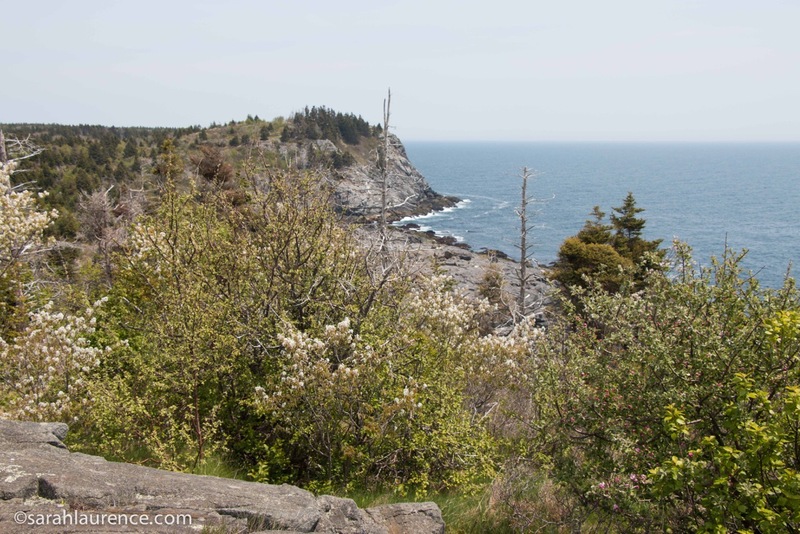 Monhegan is lovely in late May with the forsythia and fruit trees blooming, attracting migrating warblers. Spring lags two to three weeks behind the mainland. It's chillier in the spring and summer, although warmer in winter since the sea moderates temperatures. Many days are cloaked in thick fog. We were lucky to have sunny 60 degree weather for our hike day. A narrow cliffside trail encircles the island, granting breathtaking views (ie time to stop and catch your breath and take photos!) Hiking the full outer trail would take four to five hours at a leisurely pace. 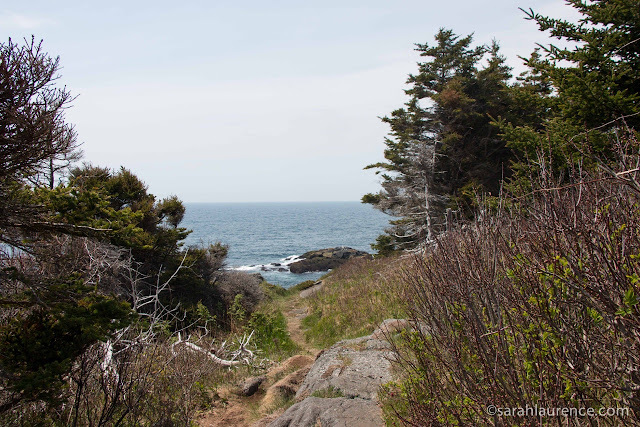 Hiking boots are a good idea, although there are easy trails leading directly to lookout points, like Whitehead. Below the 160 foot cliffs, lobster pots bob in the surf. The natural beauty of this remote island never ceases to enchant me. It hasn't changed much in the twenty-four years that I've been visiting it. I've taken countless photos, painted watercolors and now I'm writing a scene set on a fictional island like Monhegan. 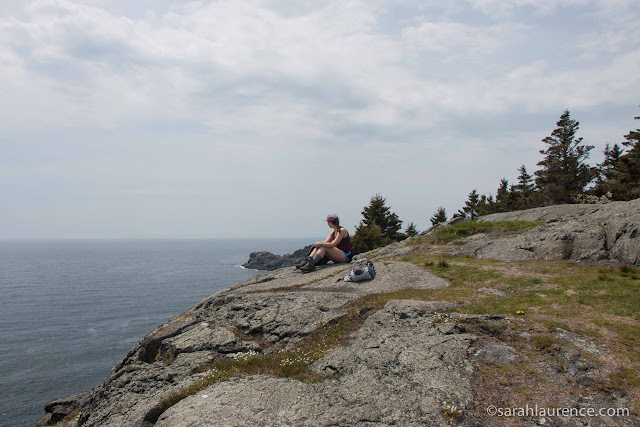 I was so pleased that my daughter chose Monhegan Island as one of her eight collection sites for her senior project. She's researching medicinal uses of native Maine plants. I'll share some of her exquisite drawings in a future post. I can't believe that my daughter is graduating from high school next week. 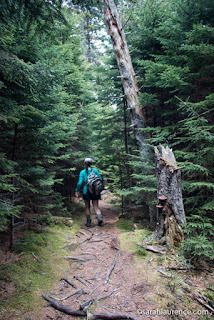 It's been so special having this time to explore the Maine woods together and to share our passion for nature and art. I'll be offline next week, celebrating with my family. At the end of the day we hiked up to the lighthouse to enjoy the sunset over the ocean, quite a rare treat for those of us on the east coast. The clear golden light was worth the journey on its own. 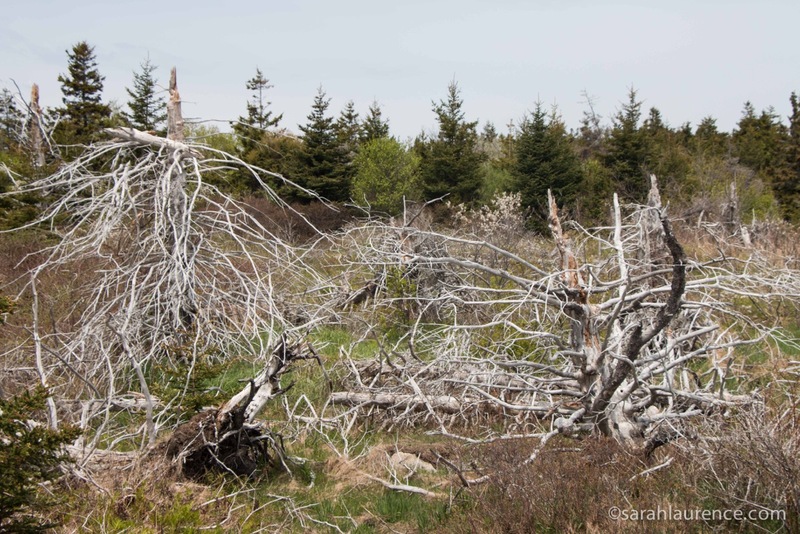 You can read more about my young adult novel and Monhegan Island here. Next post: Wednesday, June 17th. AH, haven't been to Monhegan since 2001...thanks for taking me back. What a lovely trip to share with your daughter! A lovely post! The next time we visit Maine, your island will definitely be on our list of places to visit. A weekend stay there sounds wonderful. Exciting nightlife is certainly not an attraction for us anymore:) Congrats to your daughter for achieving this milestone in life and to you and your hubby for helping her to it. And good luck with your manuscript. I can't wait to read the book! What a great post--I loved reading this and enjoyed the photos too. Happy graduation! That was an absolute treat. The writing, though short, was superb. You took me there, not just with your photos, but your language. Thanks. I really enjoyed this post. What a special trip for you and your daughter. Congratulations to her on graduating! That island looks so beautiful. I know I'd love it there. The island certainly plays a role in your life and the fact that your daughter chose the island for her senior project must link you in a new way. I love the b&w capture of her looking out of the ferry window! Wow very cool place. Thanks for the photos and post. Neat you can do these things together. Happy graduation to your daughter! Congratulations on leading another child to the jumping off point. We have one more year here for my son. 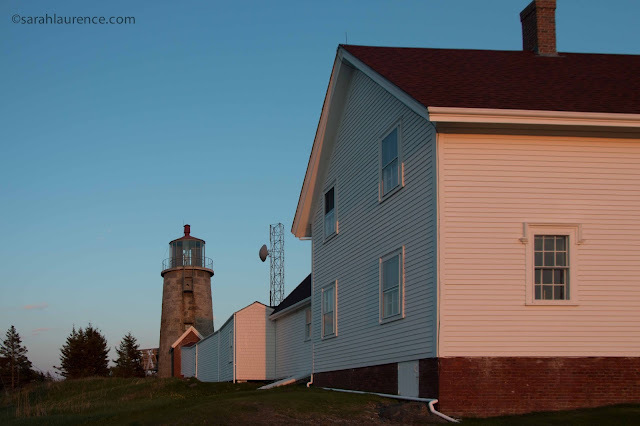 The island looks beautiful, and that picture of the lighthouse is channeling Edward Hopper. Charlotte, anytime you want to revisit Monhegan, I’m up for it. Jennifer, thanks! Are you still blogging? It was hard to find any recent posts of yours on your Google+ profile since you’ve shared so many YouTube clips. 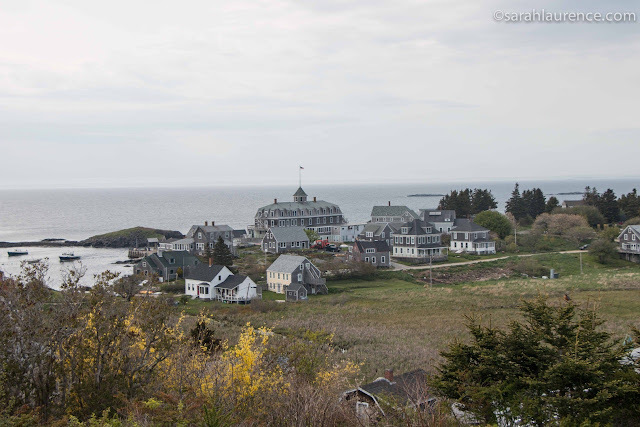 W2W, I wish Monhegan were “my” island, but I’m only an occasional visitor. ;-) I just sent my manuscript to my agent for her feedback. That’s another reason I’ve been offline lately. I’m so pleased to hear that you want to read my novel. I’ll keep everyone informed on what happens via my blog etc. Fingers crossed! ACIL, thanks so much for sharing your reaction. I’m blushing. Petra, I’m not a big nightlife person either, you may have guessed! Your experimenting with photography and filter on your blog inspired me to try something different. I still prefer print film for black and white. Les, I thought about Edward Hopper too, when I saw the light on the lighthouse. He did some fine paintings of Maine. Best of luck to your son and you: senior year is stressful.